How Much Space Does iOS 12 Take Up? Every update on iOS is worth downloading and installing because of the assurance that there is something new and interesting. 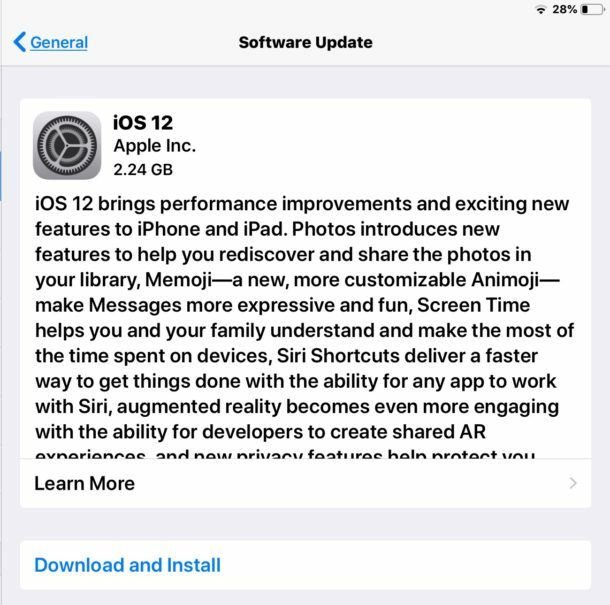 Just as iOS 11 came with so many mind-blowing features, so is iOS 12. However, before upgrading to iOS 12, we should make one thing clear: how much space does iOS 12 take up? 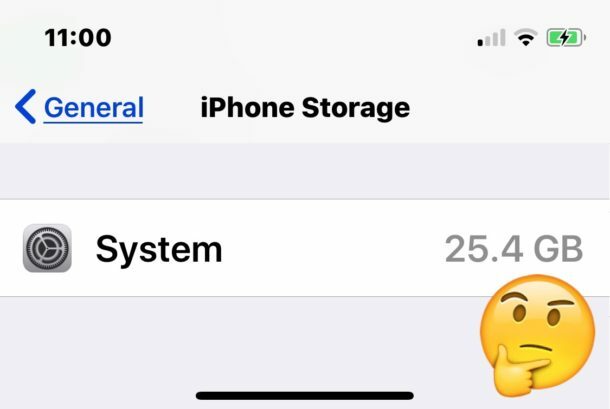 If you’re an ardent iPhone user who uses their device heavily for activities such as to listen to podcast, play heavy games, take photos regularly, then you may have encounted the much dreaded “Not Enough Storage” prompt. 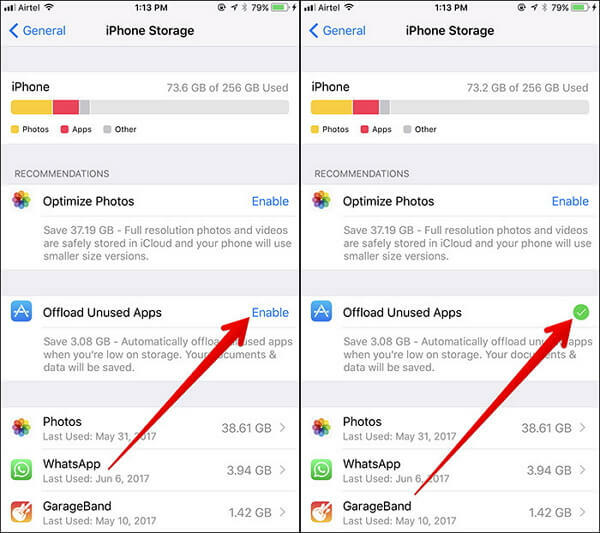 This article will show you stress-free ways to free up huge space on your iOS 11 or iOS 12 device. Part 1: How Much Space Does iOS 12 Take Up? Part 2: Free Ways to Get Enough Space Required for Running iOS 12 Smoothly! The official iOS 12 public is about 2.24GB. Does it mean that you can have only 2.24GB free space before installing iOS 12? NO! 2.24GB is actually not enough. Acutally, because it requires at least another 2GB temporal space to install iOS 12, you are expected to have at least 5GB free space before installing, which can promise your iPhone/iPad run smoothly after updating. We can expect the latest iOS 12 to run much faster than the old version, like up to 40% faster app launch, up to 50% faster keyboard display, or up to 70% fasterto camera. However, if you don't have have enough space, how can the iOS 12 realize its value. Note: Don't leave your iPhone or iPad with just a few GB free space because it can be easily full of storage, which is much easier than you thought. Free Ways to Get Enough Space for Running iOS 12 Smoothly! 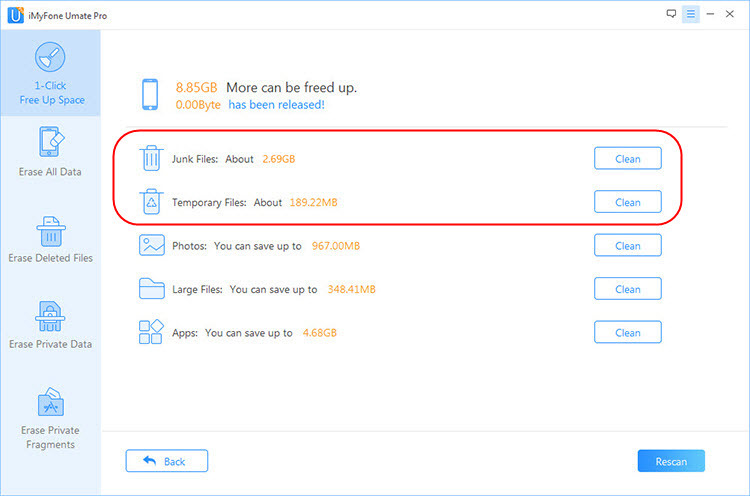 To be able to meet iOS 12 space requirements, you are obliged to understand and ascertain which files and applications occupy the largest chunk of your iPhone storage and find a convenient way to optimize it. On a conventional level, let us discourse what should be optimized on your iPhone. Junk & Temporary Files, App Caches, Corrupted files: These redundant files accumulate at a very rapid pace, and will damage the performance of your device and reduce the effectiveness. Too many such files can even lead to iPhone stuck and App crash, so we should firstly delete these files. Previously Deleted Files: The deleted files will still exist on your iPhone before having been totally overwritten. These useless files also eat up your storage though they are invisible. And if you have deleted some sensitive files, they can even be recovered by data recovery software as they still exist on your iPhone, that may lead to privacy leak. Large Files: When we talk about large iPhone/iPad files, we’re talking of 4k photos, videos, music, and other files that occupy a large chunk of iOS storage space. 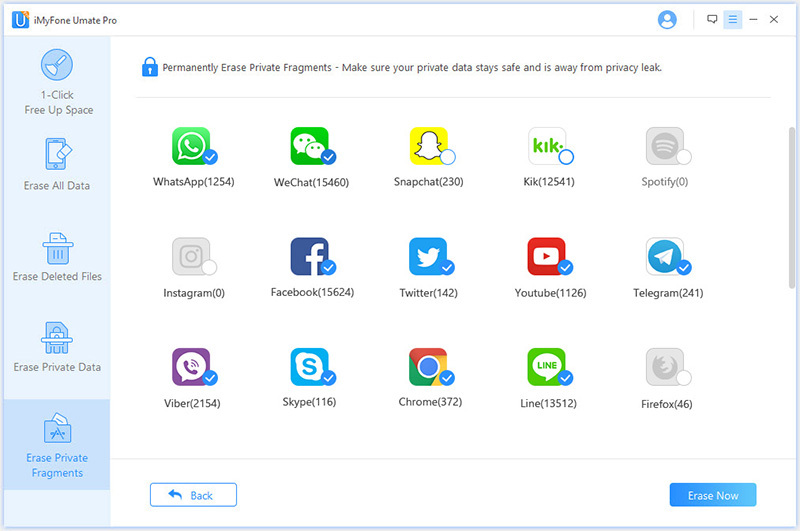 Incomplete Fragments of Third-Party Apps: You can easily delete visible files in iPhone, but incomplete traces of third-party apps such as WhatsApp, Skype, Snapchat, etc. can’t be easily deleted because they’re invisible to iOS 12. From the above paragraphs, we’ve established that junk, temp files, app caches, and app fragments are hidden in your iOS 12 device storage space. Hence, if they are invisible to iOS 12, how then can you clean them out of your storage space? The best way to achieve a clean and optimized iPhone storage space is to use iMyFone iPhone Cleaner. iMyFone iPhone Cleaner is a powerful iOS cache cleaner that’s designed to delete needless files and photos from an iOS special at deleting such files on iPhone/iPad/iPod Touch. The trial version of this app - clean junk files - is completely free of charge but the paid versions have more fantastic features for iDevice optimization. iMyFone iPhone Cleaner received lots of positive reviews from users, and has been highly spoken of by famous media, like Macworld.co.uk, Makeuseof.com, Cultofmac.com. To use it, you just need to connect your device, then scan your device and click on “Clean” at last. You can permanently erase deleted files that are still lurking in your iOS device storage space using iMyFone iPhone Cleaner. This is because when your iPhone is scanned for deleted files, and such files are permanently erased using iPhone Cleaner, and then the erased data/files are 100% unrecoverable, even by the most modern recovery software. 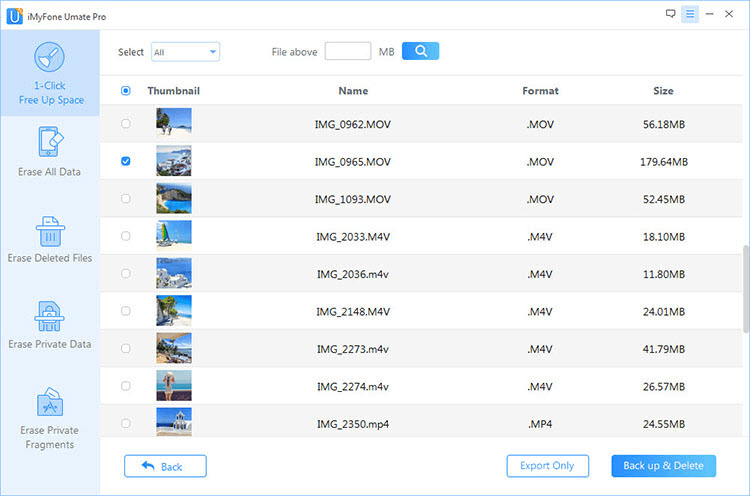 You can try the “Erase Deleted Files” feature of iMyFone Umate Pro, which would scan your iPhone to find for free and erase all deleted files. This option is especially suitable for those who often share their iPhone with friends / family members, or plan to send your iPhone to repair. As for some sensitive data, like bank account and passwords, private chat history/messages, personal photos/videos etc, we may not want anyone else get access to them. So the best way is to permanently erase all them before giving your iPhone to others. To deal with the large size photos and videos, you can choose to back up the original files to iCloud, and stored compressed ones on iPhone, by enabling Settings > Photos & Camera > iCloud Photo Library > Optimize iPhone Storage. 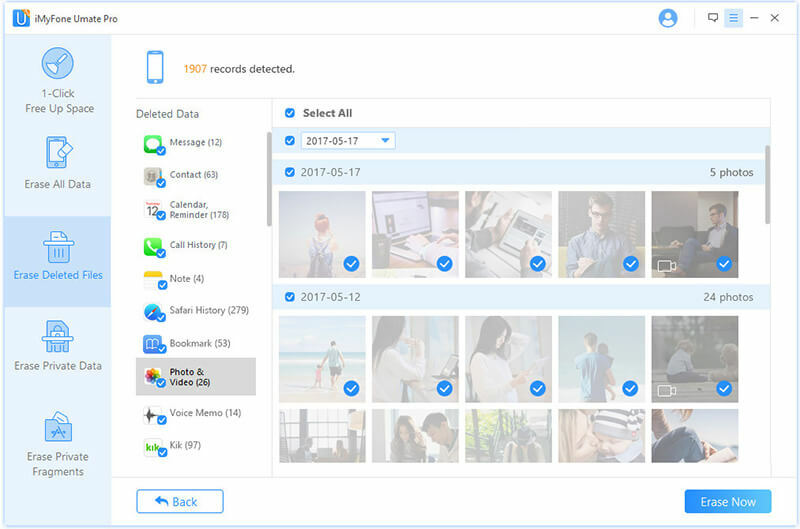 However, for the invisible photos and videos, or you want to delete them, you should still turn to iMyFone iPhone Cleaner, it can detect and list all photos and large files on your iPhone, you can preview and decide to backup and delete them. Except that, iMyFone iPhone Cleaner also allows to losslessly compress iPhone photos, which reclaims 75% of your photo space, and you’ll have auto backup for your original photos on computer. Deleting credit card records and Apple pay information from iPhone doesn’t mean such records and data can’t be recovered. A good recovery software can recover such information and use it to leak up your savings and income. Therefore, there is a need to completely wipe third-party app traces from your iPhone using iMyFone iPhone Cleaner. The iOS Storage section of the Settings app shows the amount of iPhone or iPad storage occupied by different apps and files. 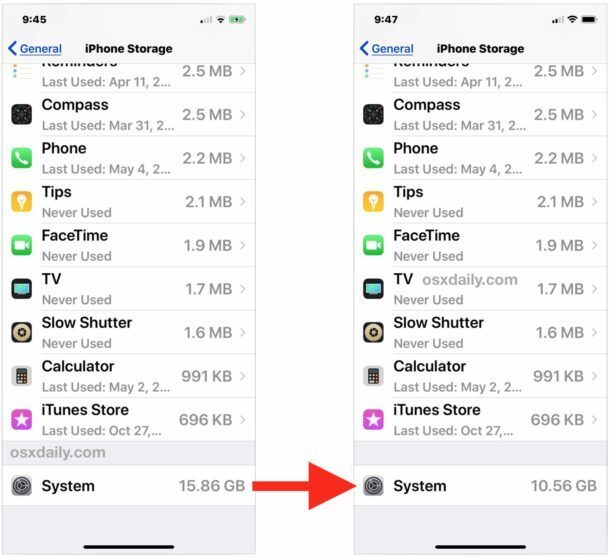 The “System” storage is the section taking up by iOS firmware and other default apps. “System” can be widely different sizes, sometimes it’s 7GB, but it can also easily be 10GB, 15GB or even 25GB. For example, if you’re using a 16GB iPhone, the system would be 4GB while the system for 64GB iPhone would be 9GB. The system storage will also change every times when you make an iOS update. Check System Storage by clicking “Settings > General > iPhone storage” then, scroll down to System. Step 1. Connect your iPhone to PC or Mac and launch iTunes. Step 2. Unlock your iPhone, and trust your computer. Step 3. Leave your iPhone connected to iTunes for a few minutes. You don’t need to do anything. Step 4. Then launch your iPhone “Settings” app, and go to “General > Storage > System”. The system will recalculate and at this time, it will be considerably lower. Step 5. Disconnect your iPhone from computer and enjoy your new free storage space. However, this method of iOS system storage recovery doesn’t always work. There is no promise that it will reduce how much space. It could free up over 5Gb space or less than 1GB. If you’re still struggling with lack of storage space after downloading and installing iOS 12, then you can try these tricks. In iOS 10 and below, Apple prevented users from deleting pre-installed apps on iPhone, iPads and iPod touch. Now, you can easily delete some of these apps, and erase the app data of others that can’t be deleted. Social media apps like WhatsApp, WeChat, Facebook, Twitter, Skype, etc. can easily accumulate app fragments, but uninstalling and reinstalling these apps will take away those fragments associated with them. If you still have game apps you’re done playing, apps you never click, or files you never open, then it’s time to offload them in order to have more space for iOS 12. To do it, you can go to "Settings > General > iPhone Storage". Click "SHOW ALL" and you will see the option "Offload Unused Apps". Turn it off. It may seem hard to delete all your messages at once, but there is a way you can make them go away after a period. Go to “Settings > Messages > Massage History > Keep Messages”, and then select a time for messages to expire. For example, select 30 days. 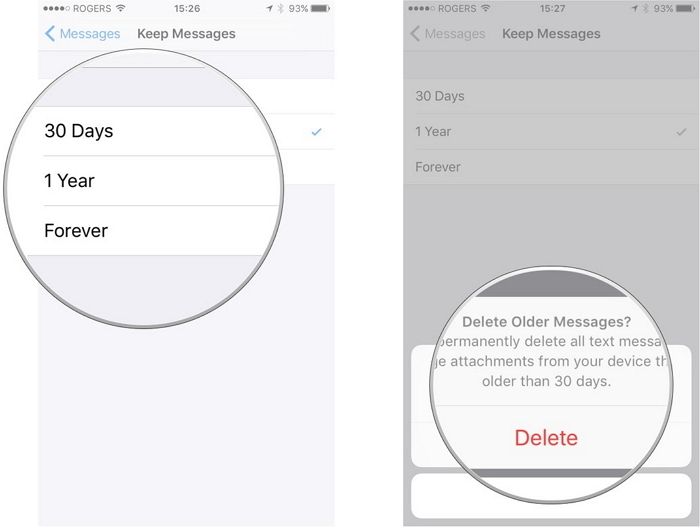 Tap “Delete” on the prompt to delete all messags and file attachment older than 30 days. If Photo Stream has turned on all your devices, then you can view photos you took from one device in all the devices you have. These images will take up your storage space, which makes it advisable to turn this feature off. Go to “Settings > Photos < deselect Photo Stream”. 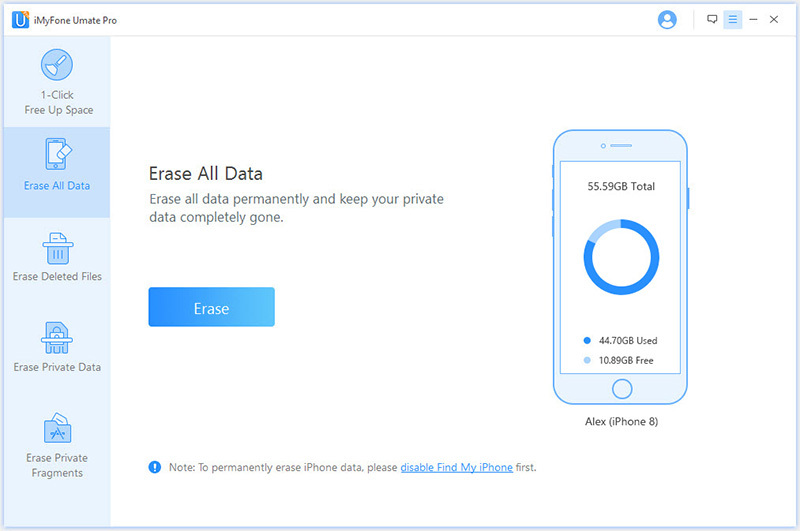 Use iMyFone Umate Pro's "Erase All Data" to completely wipe out all the data on your iPhone or iPad, and then connect to iMyFone TunesMate to restore your iPhone data without any hassle. However, make sure you’ve backed up your iPhone data before embarking on this tip. Erasing all the data and restore backup to iPhone will save you a huge amount of space.